Brewtopia Events and the Classic City Brew Fest are operated by Owen Ogletree of Athens, GA. Owen is a certified beer judge, beer author, beer traveler, award-winning homebrewer, and a founding member of "Georgians for World Class Beer." 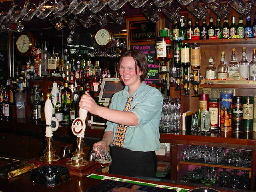 In June of 2001 Owen visited several beer bars and brewpubs in New England by starting in Rhode Island, going north along the coast through New Hampshire up to Bar Harbor, Maine. He then circled westward and back south through the centers of Maine and New Hampshire. Below are some pictures and brief notes regarding some beer spots in the order visited -- it's a big list so give it time to load all the pictures. Owen always welcomes your e-mail and input. How to make 3 gallons of easy all-grain homebrew without extra equipment or trouble! Recipes for the above procedure. Impressions: This is the first place I hit after my plane landed in Rhode Island. 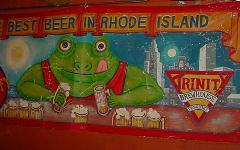 This brewpub is a little hard to find, as the streets in Providence can be confusing. Downtown Providence is quite compact and easy to walk -- the next brewpub on the list is very close. Trinity is a cool, funky place with upstairs bar and dining room with a cellar pub with darts and pool. Food: Pizza, burgers, sandwiches, pub grub. Beer: Trinity Kolsch (dry and a bit tart with a hint of apple-like off flavor), Belgian White (dry, light-bodied, pleasant), Welsh Mild (too many phenols and off flavors for me to enjoy), RI IPA (dry-hopped with a nice bitterness), Copper (low aroma with a nice malt character), Oatmeal Stout (roasty, but a bit light in body). Impressions: This brewpub is affiliated with the John Harvard chain that originated in Mass. Union Station is located in a trendy mall area near the tourist center in the middle of downtown Providence. It has an upscale brick interior that reminds me of John Harvard's in Cambridge. The brew room is very small. Food: Very nice menu with steaks, seafood, tapas, etc. Beer: Summer light (clean, slightly toasty), Copper Lager (Northern Brewer and Saaz hops with very light malt), Golden Spike Ale (cascade hops and also light-bodied), IPA (corn-like, needs more hop character), Gaelic Stout (clean, but too light in body). Their beers are all very clean, but seemed to be brewed to please light beer drinkers. 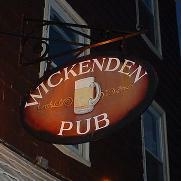 Impressions: Wickenden is a dark, cozy beer bar on an old neighborhood street just a short walk from Union Station. This is a very casual place with a nice beer selection. Food: Chips and pub snacks. Beer: Go for something with higher alcohol and flavor like a Belgian Trappist Ale or a German Dopplebock. Impressions: This is the brewery where Redhook produces its products for consumption in the eastern states. The first Redhook brewery was opened in Seattle in 1981, and the NH location started in 1996. There are brewery tours M-F at 2pm and 3pm and Sat-Sun at noon, 2pm, and 4pm. The wonderful brewpub attached to the brewery is named after the Cataqua River and features a big gift shop and outdoor patio with some giant beer barrels for atmosphere. Beer: Blond (nice and fruity), ESB (seems a bit lighter than the bottled version), IPA (good hops), Blackhook Porter (nice roast coffee aroma with a smooth flavor), Hefeweizen (a Bavarian wheat beer with lots of Mount Hood and Willamette hops). Impressions: Started around 1990, this friendly brewpub is found in the middle of a walkable downtown. I had fun here -- there were nine beers on tap when I visited. 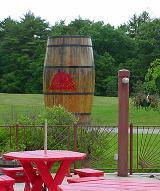 Some of their brews are affiliated with the Smuttynose microbrewery. Upstairs has food and is a bit more upscale -- downstairs is a small bar with pool tables. 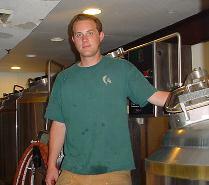 Head brewer, Sean Navish, is pictured. Food: Very tasty brewpub fare. Beer: Smuttynose Pale (could use more hops, but nice), Smuttynose Lager (malty and toffee-like), Blonde Ale (malty and simple), Maibock (toffee, malty, lots of Munich malt), Old Brown Dog (tasty American Brown Ale), Black Cat Stout (rich and full-bodied), Barn "Yahd" Pale (malty, but not really hoppy), Weizen (clean and light in flavor), Barleywine (wonderful English Barleywine with rich, complex malt and plum flavors -- wow!). Impressions: This English pub is just a short walk from the Portsmouth Brewpub discussed above. I was pleased to find good cask-conditioned ales here made by Alan Pugsley of Shipyard brewery in Maine. Beer: The owner seems to take pride in taking good care of the cask ales, and the bar also offers other nice draft and bottled beer selections (including McEwan's Scotch Ale). Impressions: I was pleased to find this pleasant brewpub tucked away over a gift shop and coffee shop on a tiny pier in Kennebunk. The brewery is located downstairs. Food: Superb local seafood and lobster along with burgers, salads, pasta, etc. Beer: Shipyard Export Ale (styled after a light Canadian Ale), Pale Ale (British style -- light in flavor with nice bitterness), Brown Ale (very clean with a light maltiness), Old Thumper (Extra Special Ale that is mild and fruity), Fuggles IPA (low hop aroma -- needs more malt and hops to be a real IPA), Bluefin Stout (great dry Irish Stout with a hint of coffee flavor). Seasonal beers are also offered. Impressions: Maine's original brewpub is a rustic, Bohemian place in the touristy part of town surrounded by shops. Gritty's has a popular mug club (see photo) and seven beers on the evening I visited. Food: Typical sandwiches and pub food. Beer: Sebago Light Ale (from the Sebago brewpub listed later), Summer Wheat (wheat and malt flavors -- a nice American Wheat beer), Raspberry Wheat (made with syrups -- tastes a little artificial), McDuff's Best Brown Ale (great roasted nut flavor -- more malty than most Brown Ales), Portland Head Light Pale Ale (dry and hoppy -- nice Cascade and Willamette hops), Cask ESB (served in good fashion -- not oxidized), Black Fly Stout (dry Stout with Willamette and Cluster hops and six different grains). Impressions: Sebago is a smallish brewpub located in the bottom floor of an office building in the heart of downtown Portland, but they do have a larger brewery just outside downtown. 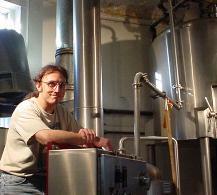 Pictured to the right is head brewer (since early 2000), Tom Abercrombie. Food: Interesting menu items that try to be unique. Beer: Wheat (a bit bland and watery), Red (malty with a good nutty character), Light Ale (clean and malty), Boathouse Brown (light in flavor), Lake Trout Stout (roasty -- good Stout), Frye's Leap IPA (has mostly bittering hops -- not many flavor or aroma hops). 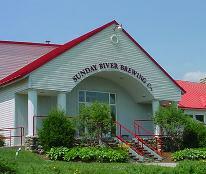 Impressions: Started in the early 1990's, this was originally called Sunday River Brewing Company, and there is another location of Sunday River with basically similar beers listed later on this website. Stone Coast does bottle some of its beers for resale. The upstairs of the brewpub will soon be a new restaurant with Blues and Jazz. This is a very attractive place. Beer: Oatmeal Stout (too light color and flavor), Sunday River Alt (malty with fruitiness and a tiny off-flavor), Surfcaster (drab ale with little character), 420 IPA (light in color with a rich malt character and nice hops), Knuckleball Ale (very good English style ale -- malty without many hops), Black Bear Porter (chocolate character -- malty and slightly sweet -- really nice). Impressions: The first thing you'll see when you walk into this small brewery are the canoes hanging from the ceiling. 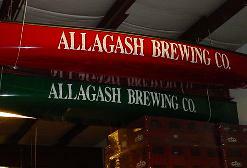 Allagash has a tiny gift shop up front and offers tours if you call ahead. The brewery is in a small industrial park located a short drive from downtown. Beer: I purchased several bottles of their beers (including some large bottles of their new Belgian Dubbel and Tripel), but have not tried them yet. Impressions: Wow! This is one of the best beer bars I've ever visited. This huge place has loads of dining rooms and a large bar area. Food: Wonderful sandwiches, chili, and many vegetarian/healthy entrees. 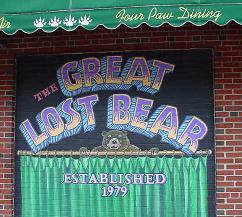 Beer: The Lost Bear has around 70 draft beers and features local micros. You can try any draft selection by ordering a $1.00 five ounce taster glass. It's fun to order several and compare styles. Beer: Light Lager (nice hops, 4% alcohol, very Czech Pilsner like), Summer Ale (light version of a Pale Ale -- English Style like a good pub Bitter), White Cap IPA (great malt and hop flavors). Other beers are available based on the season. 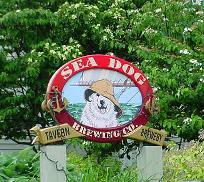 Impressions: This Sea Dog location (I visited another in Bangor) is a beautiful brewpub perched in a small shopping complex over a river with its own waterfall just outside the deck. 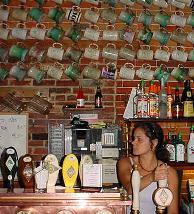 There is a rustic, maritime interior to the place with many beer medals displayed proudly on the walls. Food: Wonderful sandwiches, seafood, and many imaginative entrees. Beer: IPA (popular toffee-like beer with good malt but short on hops for my taste), Porter (chocolate, licorice, smooth, nice), Old Golly Wobbler Brown (mild flavor, slightly dry), Old Baggywrinkle ESB (flavorful at cellar temperature -- ESB doesn't get much better than this one!). Impressions: This great microbrewery used to be housed in the tiny Lompoc Cafe Brewpub in downtown Bar Harbor, but moved just outside of town to expand. (Lompoc still has their beers and is still worth a visit.) 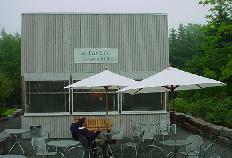 Atlantic is a fantastic place to visit, tour, and spend some time in the outdoor cafe/tavern that is open daily until 7 pm (go early). Food: Limited sandwiches and entrees in the tavern. Beer: I was not prepared for the really flavorful, unique beers that Atlantic has to offer. Braggot (made with Maine wildflower honey with lots of flavor and alcohol -- incredible), SOB Special Old Bitter (hoppy, nice, spicy hop flavor and aroma), Coal Porter (rich, dark, wonderful), Bar Harbor Real Ale (crisp Brown Ale that is light in body and flavor -- a good session beer), Blueberry Ale (made with real Maine blueberries, not an artificial flavor -- one of the best fruit beers I've ever had), Ginger Wheat (nice and spicy with a terrific balance). 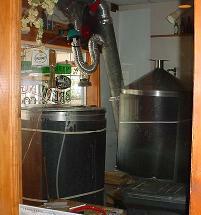 Impressions: Now this is really a MICRO-brewery -- tucked away in a couple's barn. 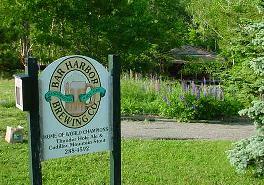 They offer tours (call ahead) at times, but you can purchase their beers in several spots in Bar Harbor. Their fine beers are awardwinning. Beer: Cadillac Mountain Stout (has won a rare platinum medal at the World Beer Cup -- very rich, malty, and chocolatey), Thunder Hole Ale (nut brown color with chocolate and caramel notes -- great American Brown Ale). They have other seasonal beers as well. 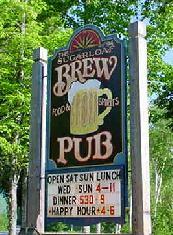 Impressions: If you drive NW from Bar Harbor up through the mountains, you'll find this homey little brewpub just outside the Sugarloaf Ski Resort. If you go in the summer, there will be shorter summer hours and the place will be pretty empty except for the occasional golfer or two. I was very pleased with the atmosphere, food, and beer here. The place is also known as "Theo's." Food: Wonderful sandwiches, seafood, steaks, chicken, pizza, and pastas. Beer: Golden Ale (light and fruity with decent hops), Pilsner (crisp Saaz hops), Amber (malty with good hop flavor), Hophead IPA (light in color with superb hop bitterness and flavor), Snowmaker Stout (very dry, roasty, licorice-like with oatmeal flavors). 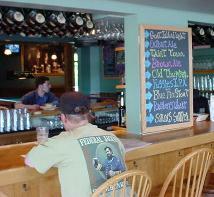 Impressions: Who would expect to find a huge brewpub on a small side street in the small town of Farmington, ME? Owners Tom and Rick have a great pub here with a brewroom (pictured to the right) that is about the size of a walk-in closet. This tiny brewhouse produces a wide range of beers, however. There are big banquet rooms and a comfortable bar downstairs with darts. Food: Seafood, clam chowder, nice pub fare. Beer: Clearwater Cream Ale (light and hoppy with a touch of vegetal off-flavor), Blackberry Wheat (light wheat beer with light berry flavor), Brown Ale (clean, good session beer), Iron Rail Pale (nice hop aroma and flavor with a hint of DMS vegetal off-flavor again), Highland Scotch Ale (butterscotch aroma, nice and malty, high alcohol content), IPA (nice NW hops, resiny aroma, good beer), Oatmeal Porter (smooth with grain-like flavors, light end of style), Steamer Stout (wonderful Dry Stout with roasty flavors). Impressions: This is a big brewpub on hwy. 2 near the NH border. It is a beautiful establishment that is connected with the Stone Coast Brewpub in Portland. Food: Sandwiches, BBQ, burgers, etc. 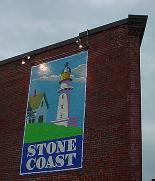 Beer: See the beer list of Stone Coast Brewpub above. Sunday River did have some beers that Stone Coast did not, and the beer at Sunday River seemed a bit cleaner and fresher. 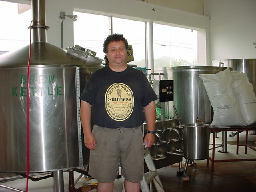 Impressions: This 7 bbl brewpub and smokehouse opened in N. Conway on July 2, 2000. It is near the southern end of the White Mountain National Forest on a very scenic drive. 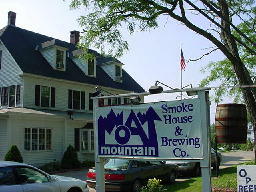 It is located in a gorgeous, old white house with brewery downstairs and lots of nice dining rooms with murals upstairs. There is also a small inn. Food: BBQ sandwiches, BBQ pizza, BBQ quesadillas, steaks, burgers. Beer: These are some of the best beers I had in New England... HoffmanWeiss (great wheat beer with complex German character), Golden Dog Pilsner (spicy with good malt and hop components), Cathedral Ledge Lager (clean and malty), Iron Mike Pale (an almost perfect American Pale Ale), Bear Peak Brown (light-bodied nutty ale), Smoke House Porter (full-bodied with nice dark malt character -- delicious), Square Tail Stout (crisp dry stout with character). Coming soon -- Maibock (sorry I missed it).